The First Book Sold By Amazon.com Was A Tome About? Like many culinary delights (such as chocolate chip cookies and popsicles), the frozen carbonated beverage was invented entirely by accident. In 1958, a Dairy Queen franchise owner, Omar Knedlik, had taken to stocking his freezers with soda bottles because he had yet to install a refrigerated soda fountain. When he served the bottled soda, it was frequently iced over and partially slushy, much to the delight of his patrons. Pouncing upon a business opportunity when he saw one, Knedlik contacted manufacturing companies to help him create a machine that dispensed frozen soda. By the mid-1960s, there were 300 machines produced by the newly minted Icee company in operation across the United States. The brand and the treat they produce has remained in high demand; there are now 75,000 machines in service that produce 300 million frozen drinks a year. 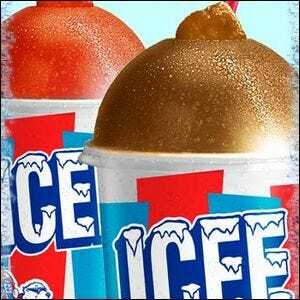 Although Icees come in 32 flavors, there’s one particular kind of Icee-style drink you’ll never find: diet. The sugar in the frozen soda doesn’t just sweeten the drink, it also serves as a control agent that helps regulate the freezing process to keep the drink icy cold yet still slushy and ready to dispense into a waiting cup. Image courtesy of the Icee Company.